Heat oven to 425°F. Line large rimmed baking pan with cooking parchment paper or foil. Spread pizza rolls in single layer on pan. Bake 10 to 11 minutes or until crispy and sizzling. Push pizza rolls together until touching. In small microwavable bowl, microwave refried beans and salsa uncovered on High 30 seconds to 1 minute or until spreadable. Sprinkle 1/2 cup of the cheese over pizza rolls. Drop bean mixture by dollops over cheese. Top with green chiles. Sprinkle with remaining 1/2 cup cheese. Bake 2 to 3 minutes or until cheese is melted. Sprinkle with shredded lettuce. Top with tomato and green onions. Drizzle with Sriracha sauce. Serve with guacamole and sour cream. Add your favorite nacho toppings, such as cilantro, black olives and sliced jalapeños. 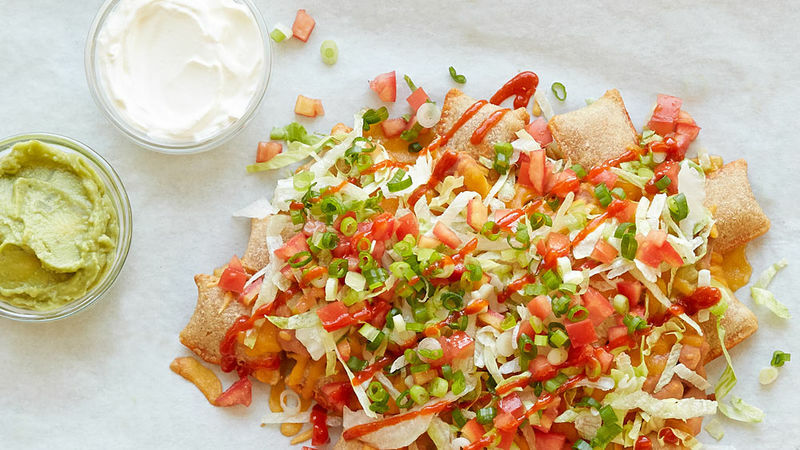 Mix it up – try these nachos using your favorite flavor of Totino's™ Pizza Rolls™, from combination to jalapeno popper.